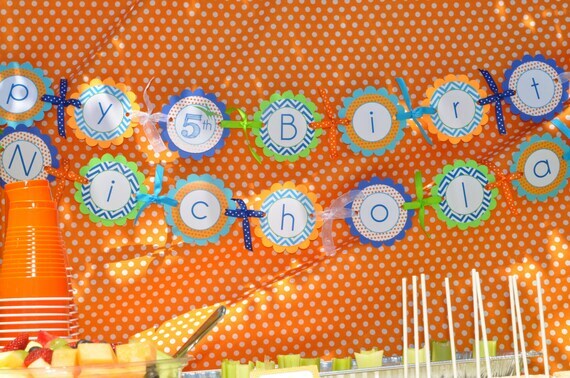 Decorate your little one's birthday party with this dinosaur theme birthday banner. Personalize with the birthday child's name and age. Features a chevron/polkadot pattern with dinosaur images on the ends of the child's name. Colors orange, green, teal blue and royal blue. **Please note the PERSONALIZATION details and PARTY DATE in the notes during checkout. If you would like other coordinating items, contact us and we'll design it for you! Please contact me with any special requests.